These are genuine replacement Media Packs for the Fluval 04, 05 and 06 External Filters. This pack contains essential media to improve aquatic conditions and fish health. 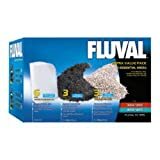 The Fluval Extra Value Media Packs provide essential replacement Water Polishing Pads, Replacement Carbon and Ammonia Remover to eliminate dirt, toxins and odours for clean and healthy water. This entry was posted in Aquatics and tagged Extra, Filter, Fluval, Media, Pack, Value by One Boutique. Bookmark the permalink.